Husky Rack & Wire sets the bar for industrial protection equipment, offering guarding enclosures and associated hardware for all kinds of applications. The increased physical capabilities of motorized machines, autonomous or non-autonomous, have made protection within the industrial workplace a much-needed requirement. It has both direct effects such as improving worker safety and preventing hazards, and indirect ones such as boosting overall performance of employees. Husky Guarding is the best way to ensure maximal protection from hazards within the workplace, and it is completely OSHA compliant and classifies as a Robotics Industry standard safety product. In a nutshell, Husky’s machine guarding is the optimal solution for protecting your workers in a versatile, affordable and attractive manner. 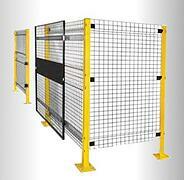 Compared to other guarding systems, the elegant design speeds up installation by 4 times. The use of non-progressive panels allow customizations to be made easily. Fast release carriage bolts ensure easy access during emergencies. On-site modifications are allowed thanks to the durable, modular design. Installation can be performed from outside the cell for safe access at all times. In addition to providing top of the line level build quality and protection, Husky Rack & Wire has excelled in meeting industry-specific requirements. Non-progressive panels are shipped in only 48 hours and can be used to fit the application. If user requirements are not met, Husky also offers custom dimensions. This ensures that the plant has reliable security and is ready to protect workers to the maximum potential.